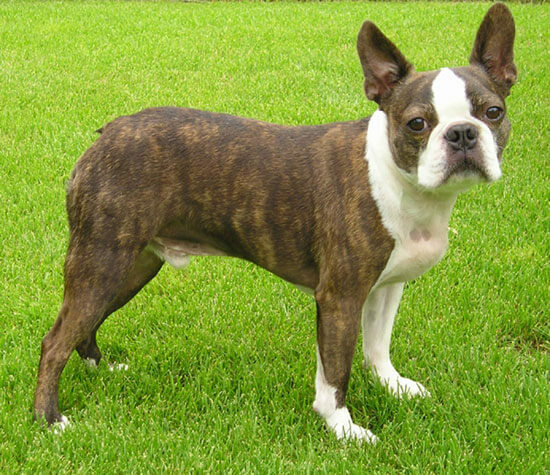 The Boston Terrier is a small purebred breed that originated in the United States. 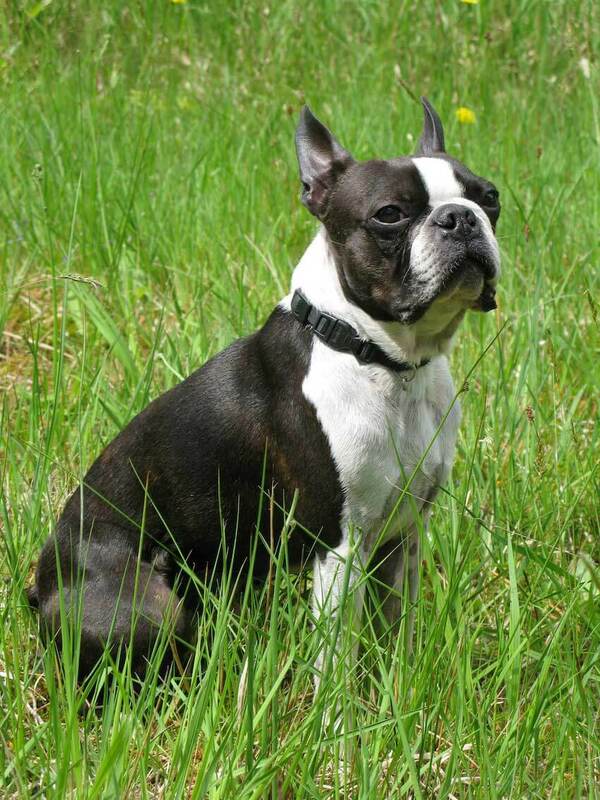 First bred in 1870, these dogs have since been a staple of Boston and the United States. They are the first American born breed to be admitted to the American Kennel Club and the first non-sporting dog bred in the U.S. Compact, easy to maintain, and apartment friendly, they make great pets for urbanites. They are intelligent, amusing, and affable dogs that will be respectful towards all members of the family, be they children or other pets. It is no coincidence their nickname is "the American gentleman." With their tuxedo-like coat and their urbane manners, they are sure to delight. 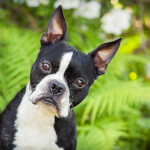 Below are the characteristics and traits of the Boston Terrier dog breed. Boston Terriers are considered small sized dogs. According to the American Kennel Club's standard, this dog should weigh no more than 25 pounds. Females are usually a bit smaller and should reach a weight of no more than 22 pounds. These dogs reach a height of up to 15-17 inches from ground to shoulder, though some may be as small as 9 inches. The American Kennel Club divides the breed into three weight classes: under 15 pounds, 15 to 20 pounds, and 20 pounds up to but not exceeding 25 pounds. Their small size and gentle demeanor makes them fantastic dogs for apartments or other small living environments. Unlike many other small breeds, which are quite delicate, Boston Terriers are strong and robust and will not injure easily. 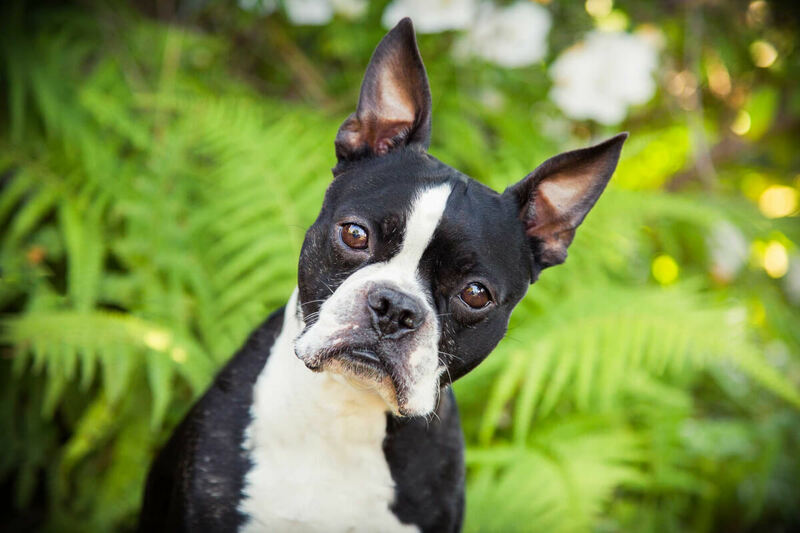 Friendly, bright, and amusing are the terms the American Kennel Club uses to describe the Boston Terrier—an accurate set of terms for this playful and loving dog. They make great companions for just about any type of owner(s), be they an elderly couple or a family with kids. These dogs are also known to get along with other pets, though they might be somewhat wary with strangers and foreign dogs. This breed is decidedly low maintenance, perfect for the family or owner who is busy but wants to have a loving pup to return to at home. Boston Terriers have a light shedding coat that requires a minimal amount of brushing. Nails, teeth, and ears will require a bit of maintenance, as with most breeds. Exercise requires for these dogs are low relative to many other dogs. A daily walk and some playtime will be enough to keep them happy. The Boston Terrier is a thoroughly American breed whose records and lineage have been painstakingly recorded. As the name suggests, the breed was first developed in Boston, Massachusetts. In 1870 a Boston man named Robert C. Hooper bought a dog named Judge. Judge, who would in time come to be known as Hooper's Judge, was a mix of an English Bulldog and a white English Terrier. 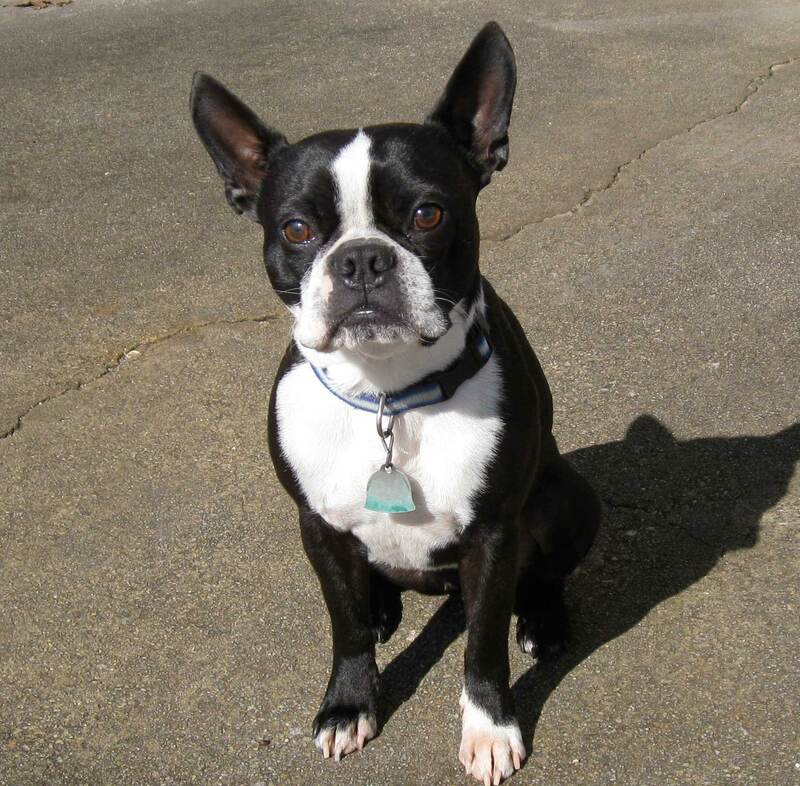 This dog became the patriarch of the breed that would come to be known as the Boston Terrier; it is now believed that all Boston Terriers can trace part of their lineage to Hooper's Judge. Judge and his progeny were bred with French Bulldogs to refine certain physical and temperamental characteristics. One of the goals of the selective breeding was to make the dogs smaller. It was common for early Boston Terriers to weigh up to 44 pounds, though Judge himself was only about 30 pounds. Today the breed has an upper limit of only 25 pounds. By 1889 these dogs had become considerably popular in the New England area, and a club called the American Bull Terrier Club was formed (they soon changed the name to the Boston Terrier Club at the behest of James Watson, a well-known writer). In 1893 the Boston Terrier became the first American born breed to be admitted membership to the American Kennel Club, and is today one of only ten American breeds recognized by the club. It is also recognized as the first non-sporting dog to have originated in the United States. In its early years, the Boston Terrier's coat color and markings were not deemed of high importance, but that was to change in the 20th century. The characteristic tuxedo-like markings have become a standard feature for the breed, helping earn it the nickname "the American Gentleman." The breed skyrocketed in popularity during the early 20th century; by 1915, Boston Terriers were the most popular breed in the United States, and remained in the top ten most popular breeds until the 1960's. Today the breed ranks around the 23rd most popular according to the American Kennel Club. This dog has been a favorite of celebrities since the early 1900's. The silent film star Pola Negri was a great fan of the breed, and reportedly took her Boston Terrier, Patsy, with her everywhere she went. One night, a restaurant she wished to dine at refused to let the dog enter. Negri became irate and cried out "No Patsy, no Pola. Goodbye forever!" In 1976, the Boston Terrier was chosen as the bicentennial dog of the U.S. Three years later, in 1979, the breed was named the official state dog of Massachusetts. A number of educational institutions have a Boston Terrier as their mascot, including Boston University, Wofford College in South Carolina, and Redlands High School in California. The Boston Terrier is a small, compact dog that should never weigh more than 25 pounds. It has a sturdy, muscular build, and should not appear skinny or frail. They have a broad chest and are well-proportioned dogs, meaning no individual part of the dog should look too big or small relative to the rest of the dog. The head is square-like, and features a short muzzle with a flat nose. These dogs are brachycephalic (brachy meaning short, and cephalic meaning head). The lower jaw is in proportion to the rest of the body, but their short upper jaw gives their face a "pushed in" appearance. The skin around the face should not have wrinkles. The ears are big and pointy and stand erect. The eyes are dark, big, and full of expression, giving this dog a particularly intelligent appearance. The coat is smooth and short and has an elegant, clean-cut look. The limbs are strong and in proportion to the rest of the body. The tail is short and set low; docking or bobbing is forbidden according to the breed standard, though you will occasionally see individuals who feature such a tail. The Boston Terrier's coat is distinctive and very uniform. The colors are white and either black or seal (a very dark brown that looks black), or a combination of the three. 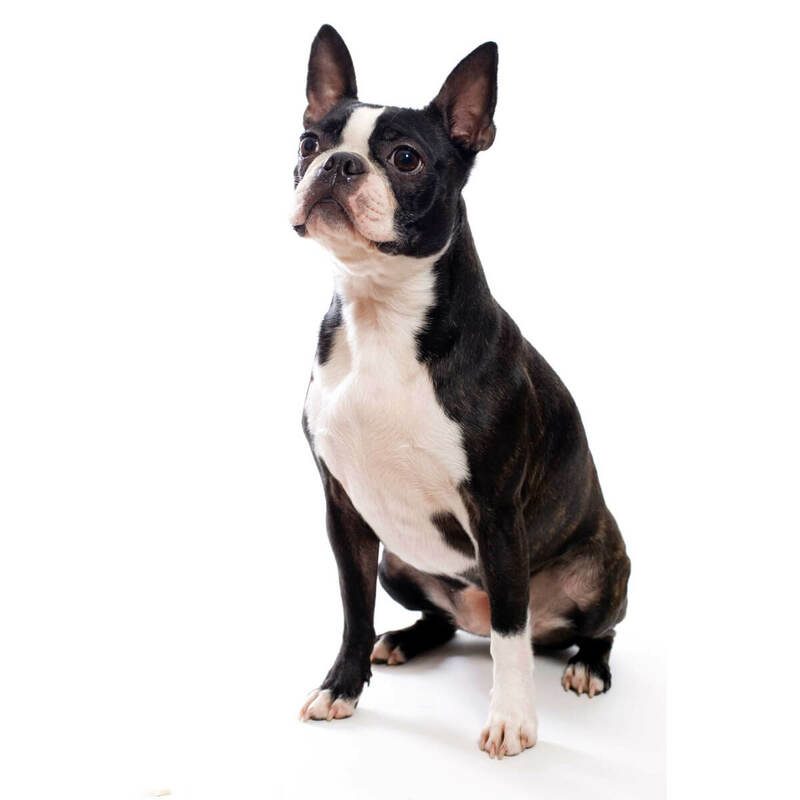 The standard for the Boston Terrier states that it should have white covering its chest, muzzle, between (but not touching) the eyes, around the neck, half way up the forelegs, and up to the hocks on the rear legs. Symmetrical markings are preferred. Other colors are not permitted by the American Kennel Club's standard, as they are obtained by crossbreeding with other breeds, causing the dog to lose its characteristic "tuxedo" coat. Boston Terrier types tend to be hotly debated. There are those who insist that there are standard as well as miniature Boston Terriers. Some go further by claiming there are also teacup Boston Terriers. Then there are those who — along with all the established kennel clubs — declare that a dog is either a Boston Terrier or not. It's said by many that these mini or toy Boston Terriers are either runts or hybrid dogs. Granted, there are little Boston Terriers. Some breeders will intentionally mate ever-smaller Bostons to have miniature or even tiny dogs that are indeed purebred. Unfortunately, such breeding practices tend to result in fragile little dogs that have very bad health problems. There are also those who claim that there are long-haired Boston Terriers, and this is also strongly argued against being true. While there may be photos of dogs that closely resemble Bostons but have relatively long hair, these claims are usually countered. Such dogs are typically crossbred or have other breeds' blood in their recent ancestors. These dogs are known to be pleasant and jubilant. They have a very outgoing personality and love to be around their human friends and family—they're the kind of dog that when let out into the yard will sit by the door, waiting patiently for their owner to join them for some fun. They typically get along with other pets quite well, and having another canine friend around for the Boston Terrier to play with when the owners are out is not a bad idea. Children will find that these dogs are great playmates—gentle and affectionate while still playful and amusing. This breed is quite intelligent though sometimes stubborn. Some Boston Terriers will be very eager to please and should train very easily, some others will require a persistent, consistent approach to training that may take a little longer. Tone of voice is important when trying to train and command these dogs. They are very sensitive—too much negative reinforcement will impede training and will therefore be counterproductive. Positive reinforcement is the way to go when teaching. Barking is not a terrible issue with Boston Terriers. They are generally quiet and respectful dogs, though they may bark if they see an unfamiliar person or animal. Again, training from a young age will make a large difference in the behavior of this dog. A properly socialized and trained dog will be a fantastic companion for nearly any owner. These dogs are very kid friendly. They are very well-mannered and small but sturdy; children can have fun playing with the Boston Terrier without fear of either dog or child being hurt. This breed is also said to be protective of kids and will act in their defense if they sense a potential threat. Other pets should not present much of an issue for these dogs provided that they are socialized from a young age. Some owners describe the Boston Terrier as acting territorial or protective in the presence of other unfamiliar dogs. It is recommended that these animals be socialized from a young age to prevent any unwanted behavior or aggression. Frequent trips to the dog park starting at puppyhood should be beneficial for this dog. This breed is not aggressive unless provoked, and though territorial, should not be much of a bother to strangers that don't seem to be a threat. These dogs are very intelligent and should quickly recognize whether a stranger is welcome or not. In any case, it is advised that these dogs be introduced to as many people as possible when young to avoid any excessive suspicion towards new people. 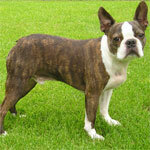 Below are pictures of the Boston Terrier dog breed. These dogs are generally considered to be low maintenance, though they may require more attention than some other dogs due to the health risks associated with their brachycephalic face. The big eyes will need to be looked after in order to keep them free of damaging debris. In order to keep the coat healthy, these dogs will need an occasional light brushing. Their exercise needs are moderate; a daily walk of medium length should be sufficient. Grooming should not be very time consuming with these dogs. Their coat is very light shedding and should require brushing only once a week or so. A thorough going over with a soft bristle brush or hound glove will do the trick. The nails should be trimmed regularly to avoid overgrowth. If you can hear the nails when the dog is walking, it is definitely time for a trim. Start this practice early in the dog's life so it is accustomed to it later in life. The dog's large ears also need to be checked regularly to avoid wax buildup or to remove debris which might result in an infection. Teeth should be brushed once every one or two weeks. 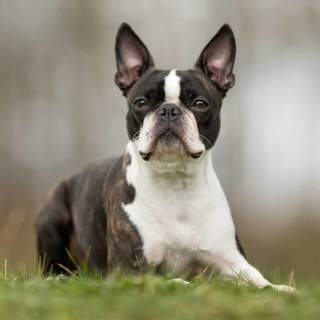 These dogs were bred in the city of Boston, a place where real estate beyond a small yard is very hard to find; owners of this breed should not worry about having a large yard, but it is still important to give a Boston Terrier its regular exercise. These dogs do not require a tremendous amount of exercise. A moderate length walk of about 30 minutes or so along with playtime should be enough to keep this dog happy and in shape. If you are an active type who loves to run, bike, or hike, be careful about taking a Boston Terrier with you, especially if it is warm outside. Due to their short muzzle, these dogs have trouble panting at the rate of other dogs and are therefore more susceptible to overheating. Consider another breed if being able to climb mountains is an essential requirement for your dog. These compact dogs can live in nearly any environment assuming they receive a proper amount of exercise and attention. Apartment dwellers are particularly fond of this breed due to the breed's small size and easy going disposition. Boston Terriers are not especially active indoors and will be happy to lounge about for most of the day. If they are going to be living in a rural location or even a yarded house, it is important that the yard be fenced in so the dog does not escape. These dogs do not like to be separated from the family and should not be left outdoors overnight or treated in a similar manner. Let the Boston Terrier be a part of the family and invite him inside. Extreme temperatures are not suitable for this dog, though that is not to say that they shouldn't be kept anywhere it snows; they are Boston dogs, after all. Just make sure to bring the dog inside if the weather is unusually hot or cold. Keeping these dogs outside is not an option. 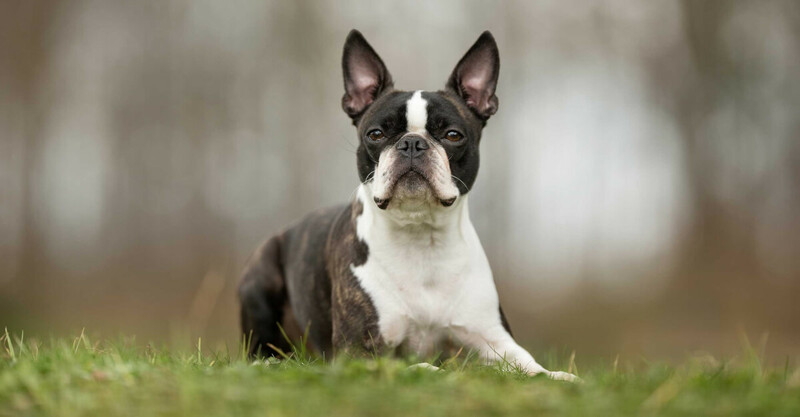 Though the Boston Terrier is for the most part a healthy breed, it is brachycephalic (short muzzled) so they will require a bit of extra care in a few ways. First, be wary that this dog is more susceptible to overheating than other non-brachycephalic breeds. When taking this dog for a walk, use a Y shaped chest harness as opposed to a throat collar. The latter tends to restrict breathing which can be very dangerous for this breed. Do not take this dog out for a run when it is very hot or humid outside. Nor should you smoke near the dog, use harsh chemical cleaning products, and keep him away from freshly cut grass and other sources of allergens. Basically, treat this dog like you would a person who suffers from asthma. The breed's big eyes do require a bit of extra upkeep as well. Dust and other debris can get in the eyes and cause problems if not treated. It is common for owners of this breed to carry eyedrops when walking the dog, especially when in a big city. Check the eyes daily to make sure nothing is bothering them. In cold weather these dogs should either be inside or be wearing some kind of doggie sweater or coat when outside. In any case, do not leave the dog outside for too long. 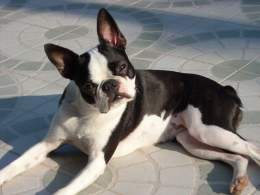 If your Boston Terrier has wrinkles, it is important to wash and dry the skin folds after meals. Work on establishing a good relationship with your veterinarian if you adopt one of these dogs. 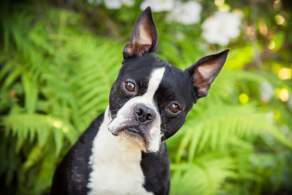 Boston Terriers should see the veterinarian for an annual wellness visit that will include an eye-check, a check for parasites, and possibly bloodwork. Furthermore, make sure the vet uses only the most modern anesthetics (such as isoflurane) as this dog is more sensitive than other breeds. Some vets are not mindful of the extra danger of anesthetizing short-faced breeds. If you take good care of your Boston Terrier, they should live a very happy 13 to 15 years.